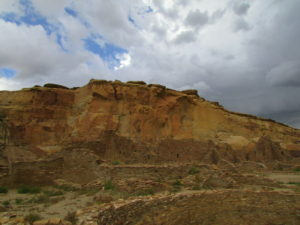 ALBUQUERQUE, N.M. — The federal government is proceeding with plans for a December auction of oil and gas drilling leases on thousands of acres of land in the Greater Chaco region. A comment period on the proposal opened today and will continue through October 31, despite a pending Senate bill that would protect the area, and without a cultural review and consultation promised by Interior Secretary Ryan Zinke. Miya King-Flaherty, an organizer with the Sierra Club Rio Grande Chapter, said the government is violating its own procedures by not having a resource management plan in place. Under the Trump administration, the oil and gas industry is once again booming in New Mexico. But King-Flaherty said it comes at a price – including diminished air quality, groundwater loss, a reduction in wildlife habitat and community health impacts. King-Flaherty added that any new drilling should take into account the recent Intergovernmental Panel on Climate Change report that said without concerted efforts to end reliance on fossil fuels, extreme climate disruption will increase significantly within 12 years. “I think more people are starting to be more aware of how oil and gas drilling is really exacerbating climate change and how this current administration is really rolling back regulations that have been put in place,” she said. The BLM is not accepting online comments, but rather protests must be submitted by mail or hand-delivered to the BLM state office in Santa Fe, and will only be considered valid if each parcel being protested is specially listed.